Highland Avenue might just be considered Hickory’s new happy place. Opened in April 2013, the restaurant and bar—and an adjacent event space, The Crossing—is stylishly filling tables, even on a Monday night, a recent visit reveals. Situated along its namesake street, on Hickory’s southeast side, Highland Avenue is where the old Hickory meets the new. Ladies in sun hats recline in Adirondack chairs, sipping icy spirits and nibbling on farm-to-table hors d’oeuvres on the patio of the former 1930s Hollar Hosiery Mill. Joining in, I raise a glass of cold, frothy pink liquid to my lips, against the backdrop of a cloudless blue sky and the behemoth brick and steel Hickory Chair Factory across the way. The Burlesque cocktail, a refreshing mix of citrus, gin, and juice with a dark sour cherry nestled in the bottom, is one of the bar’s signature offerings. The bar menu showcases the playful side of Chef Kyle McKnight, who draws on his childhood spent traversing Europe. Among the offerings, the amusingly titled Dauphine Cove provides a savory crunch with a choux batter-fried crust, velvety smooth interior of whipped root vegetables, and sweet potato at the base. The generous serving of bite-sized spheres should be dipped in the benne seed-sorghum crème fraîche. Another bar bite, the plump Shell Station scallop, is large enough to share. Sinuous forest mushrooms, a sprinkling of pretty microgreens, and parsley-roasted garlic pistou deliver deep savory goodness. All under $10, these appetizers create the kind of welcoming atmosphere sought by owner Meg Jenkins Locke. “We see breaking bread as a sacrament,” says the hospitality doyenne, while noting that she also welcomes a younger generation that might want to be in and out, with a cocktail and substantial snack at the bar, for under $50. “I wanted a sense of well-being restored, approachability, and affordability, and we’ve found that balance,” Locke explains. I found that sentiment to be true upon my recent visit. The lamb shank, enveloped in a dark sauce of unctuous caramelized honey with sweet turnips and radishes (reminiscent of slow-cooked Alsatian sauces), falls off the bone. 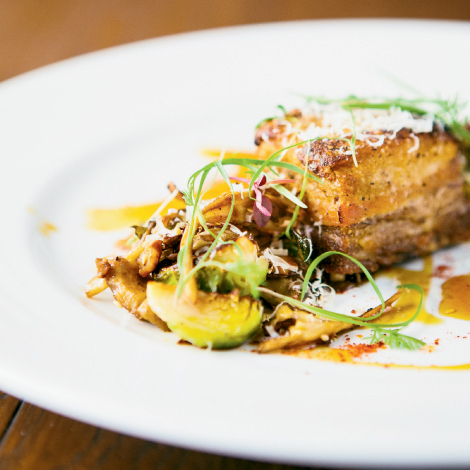 A tiny square of the luxuriously fatty pork belly is plenty; its lightly caramelized crust and tender, moist meat harmonizes with charred Brussels sprouts drizzled in allspice sorghum sauce. A risotto made of barley and smoked carrot mascarpone strikes me as an incongruous side, with odd little balls of grain rolling under the tongue. And the Appalachian trout tastes of a Sunday meal in France, with crisped skin, sweet potato confit, and lusciously melted leeks. Sage, celery root, and brown butter add delicate nuances to this light dish. McKnight stresses that he doesn’t want to become so innovative that he loses his audience. “We have a burger on the menu, but I’m going to grind the beef and make our aioli,” he says. He does like to tweak standards, like a bresaola that tastes of Bavarian spices. When he cures ham for house-made charcuterie platters, he falls back on German Stuttgart ham recipes, with coriander, juniper, and fennel. As for Locke, she brings decades of restaurant experience to Highland Avenue, as well as a new generation of restaurateurs. Her two sons work with her: Robert is general manager and Will runs the event space. And indeed, plenty of cool—plus quality and originality—meet at the crossroads that is Highland Avenue, ushering in a new era of fêting and feasting in Hickory.